Using an NDT room save both time and money when it comes to product evaluation and research. This type of project is commonly used in forensic engineering, mechanical engineering, electrical engineering, aeronautical engineering, and medicine. 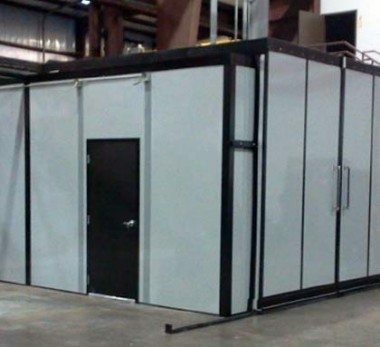 Panel Built can design NDT Testing rooms completely enclosed for testing in absolute darkness. Depending on the application, ASTM requirements for the room can be met providing a safe sterile environment for employees. The NDT Testing room can be designed with characteristics of both our modular in-plant office and our custom cleanrooms. They can be made to have increased soundproofing, insulation, and even fire resistance to provide the most controlled and safe environment possible. Whenever you are doing NDT tests that are instrumental to major laboratories, companies, and corporations, it is vital to have the highest quality NDT Testing room possible, and that is exactly what we deliver.